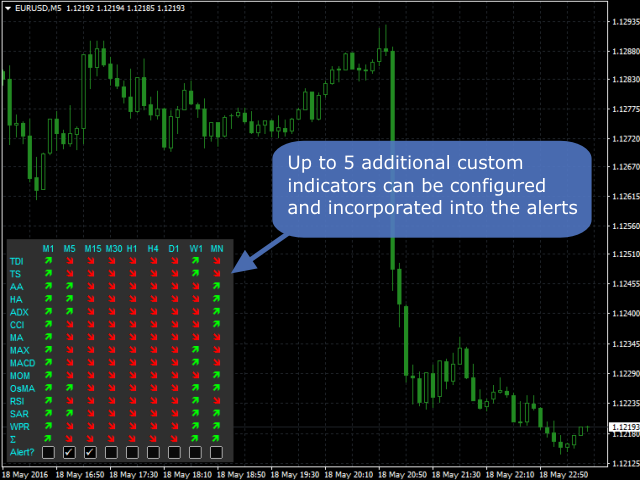 The product offers a great way to create an alert when multiple indicators are in agreement, whether they be standard indicators or custom indicators, including those purchased via Market. 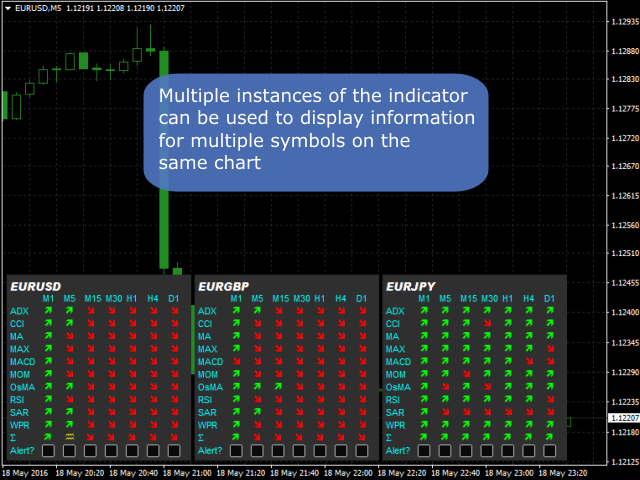 Information on multiple symbols can be shown on the same chart by using multiple instances of the indicator, each configured with a different symbol and position. The properties of the standard indicators can be changed via the indicator inputs and a wide variety custom indicators are supported. The standard indicators shown by default are: ADX, CCI, market price above/below Moving Average (MA), Moving Average Cross (MAX), MACD, Momentum (MOM), OsMA, RSI, Parabolic SAR, William's Percentage Range (WPR). Any of these can be turned off. Notes when using strategy tester: The test needs to be running at least market speed for the alert tick boxes to work. Alerts will appear in the Journal tab. Indicators on the weekly and monthly timeframes may not be calculated. Important_alertThresholdPercentage - Threshold at which alert will happen, e.g. if set to 75 would mean 75% of indicators would need to agree for alert on the timeframe. Important_alertOnlyWhenAllSelectedMatch - If true, then will only alert if all the selected timeframes are in agreement. Important_defaultAlerts - Set to 1 if alert should be on by default. Values are comma separated for each timeframe. Important_periodsToShow - Periods (timeframes) to show. Values are comma separated. Important_symbol - Symbol to show information for. If blank will be the symbol of the chart. CustomN_indicatorDisplayAs - Indicator name to display as in the matrix. If left blank then will truncated CustomN_indicatorName. CustomN_indicatorProperties - Indicator properties. Should be comma separated in the order they appear in the indicator. Boolean type inputs should be set as 0 or 1 and text inputs should be enclosed in double quotes. If left blank then the default indicator properties will be used. CustomN_colorIndex - Color index of the indicator to show in matrix. Can be comma separated if buy and sell indexes need to be supplied. Note, further details for setting inputs can be found in the manual - a link to which is in the Comments tab. 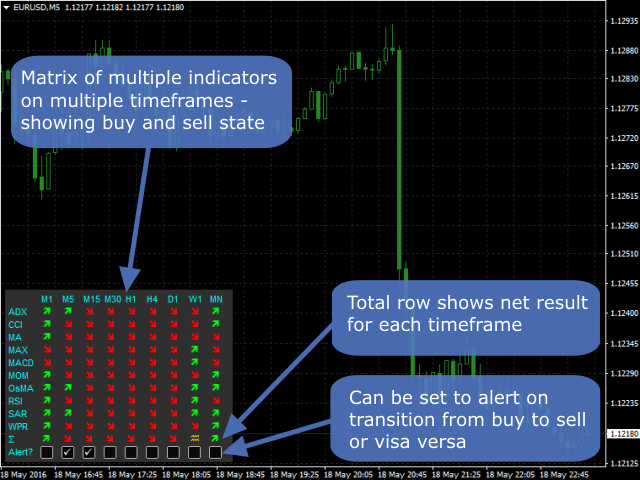 Strategy Automator converts custom indicators, like this, into an EA that can trade automatically. Great Product, Great Team, Great Support and i think nothing else needed to buy this product. Indicator matrix as other 2 flagship Runwisefx offerings have very specific role. As mentioned in combine and automator reviews Runwisefx is not the company which provides let say 100 100$ products with a superficial role and only minor difference in between the offerings. My understanding Runwisefx have only 3 flagship products with clearly defined symbiotic roles between each other which grants the company ability to introduce substantial depth in enhancing functionality of aforementioned offerings as well as setting aside a healthy amount of time for support. From my perspective as a client it is most certainly a winning combination. Indicator matrix per se providing multi indicator and multi time frame resolution that will take only few inches off your monitor real estate and is a big help in discretionary trading in particularly along with combine. Challenging to add something to what I've already stated in combine and automator reviews so will just mention that out of 7 or so dashboards circulating in mt4 market indicator matrix to my set of needs is the most potent dashboard by miles and symbiotic "sync" with combine and automator makes purchasing this one a no-brainer! Runwisefx support is a top notch and I'm completely satisfied in this area! If you do discretionary trading and would like to enhance your strategy with MTF capabilities as well as save on a monitor/chart real estate this indicator is for you!! I have bought numerous products off Mark & I would have to say they are all outstanding. But what exceeds what he has to offer is the after sales support. He is incredibly helpful with all the questions & change requests I have submitted. And is also prompt in responding to emails. There are a lot of people out there in the forex world selling snake oil in an attempt to make a buck, but this product & Mark is not one of them. If anything he over delivers! This stuff is very great tool! I regret having bought other tools from other sellers before this purchase! Works very well, only word much better two: great great !!!!!!! Possibility to customize the dashboard by inserting owners indicators is something fantastic. If you have your own winning strategy this is what he does for you: FIVE STARS !! Particular note for the author: very positive approach with customers and immediate answers, very kind. - Fixed issue capture method 'increasing/decreasing' with old set files from prior V3, where wouldn't work unless 'custom mid point' input was set to blank instead of 0. With this version 0 will work also. - Fixed issue where same shift was being applied to both fast and slow moving averages for moving average cross, where needs to separate. - Added ability to set shift for moving average based values. See new inputs Property_MAXshift and Property_MAshift. - Added objects that can be used by an EA to get values from the matrix. See the manual for more details.